Gold has been on a tear since the start of this year. It is the best performing asset with a 16% rise in 2 months, however, if you are planning to enter gold at these current levels, you are likely in for a big surprise. Gold is overbought and technical analysis is pointing to a drop in gold price to the $1150/oz. level, a good 10% lower from the current levels. The equity markets are in a bounce/rally mode and likely to remain buoyant till end of March. Oil prices, which were causing a scare worldwide are also on the mend, the bottom is likely in place at $26/barrel. The Nonfarm Payroll data, released on March, 4th 2016, has given a green signal to the FED to move ahead with the next proposed rate hike. Whether they go ahead with the hike or postpone it till the next meeting is difficult to assess, but the U.S. Dollar will likely trade with a bullish bias as long as the chances of a rate hike remains on the table. A strong dollar dims the sheen on the yellow metal, if the dollar continues to remain strong, gold will likely come off towards our target low area of $1150. Technically, gold has risen from its lows without any retracement, as shown in the chart below. Though gold has broken out of its long-term downtrend, the market participants should remain cautious on it. Many bulls will want to pocket their profits as gold is nearing a resistance area. The bears will enter shorts closer to resistance. With both of these events coinciding together, gold will retrace back to its breakout level. The bulls will buy closer to $1190/oz., which was the earlier resistance, they will attempt to defend the level and support the market. The market can either take support at $1190/oz. or drop down towards $1150/oz. area to shake out many long positions before rising again. 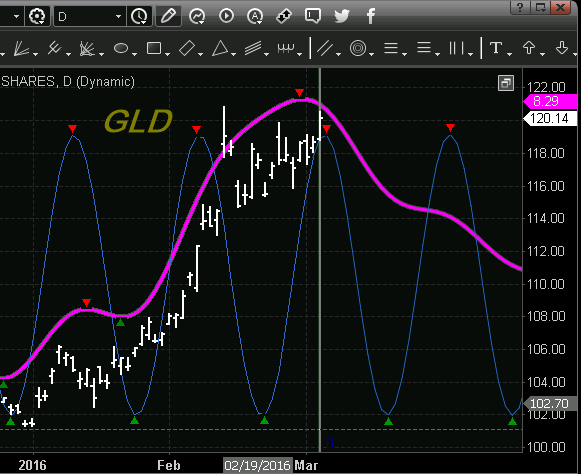 Take a look at my gold cycle analysis. The pink line is a blend of multiple cycles and follows the actual price very closely and allows me to predict into the future if the bias will be downward or rising. Both Societe Generale and Goldman Sachs are negative on gold with targets of $1150/oz. and $1000/oz. I totally disagree with them on their longer bearish views, I want to make it clear that I am not bearish on gold from a longer term perspective. Gold price will make new highs in the coming months, however, the next 10% move for gold is down rather than up. I want my readers to enter long positions close to the bottom, in order to maximize their gains. So wait, for the right time to enter again closer to $1150-$1190/oz. levels. It will be the last opportunity to buy gold before it embarks on a new long-term bull trend.